Click Here for our Wholesale Store 2 - Pack. Magna Shine Ceramakote Protective Ceramic Coating is the latest innovation in paint protection offering 3 to 5 years of protection against harsh environmental elements and UV rays. 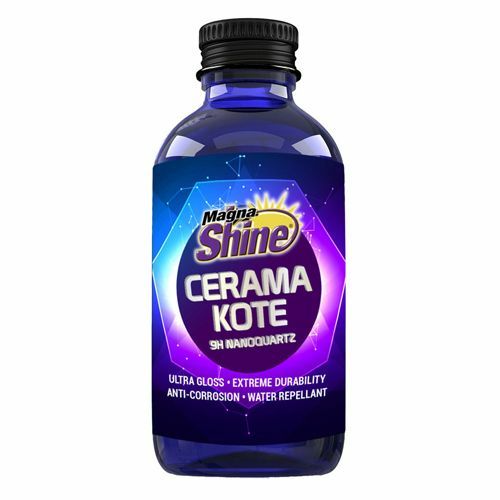 The revolutionary Magna Shine Ceramakote Protective Ceramic Coating is an advanced hydrophobic clear nanomolecular crystalline formula that repels water, road grime, dust, dirt and other contaminants while offering a high gloss shine. 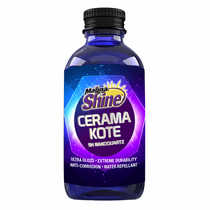 Magna Shine Ceramakote Protective Ceramic Coating's 2.4 micron, �9H� formula is easy to apply to your paint, wheels and other non-porous trim. Inspect the paint for surface imperfections and swirl marks. These will need to be repaired prior to Magna Shine Ceramakote Protective Ceramic Coating application. Begin by thoroughly washing the vehicle using a cleansing detergent that is free of oils and synthetic waxes. Dry the entire vehicle you intend to treat with Magna Shine Ceramakote Protective Ceramic Coating. Deep clean the paint and remove all embedded contaminants and clean the paint, glass and chrome trim using Hi-Tech Magna Shine Clay Bars or the Magna Shine Clay Alternative line of products. Polish any swirl marks or scratches in the paint using your choice compound and/or polish; along with wool and/or foam pads. Do not use products with excessive fillers, as these will be stripped and removed during the next step. IMPORTANT: Imperfections in the paint can be amplified if not correctly removed. Using a spray bottle, mist the surface with a 50/50 isopropyl alcohol and water mixture. You may also use an �Iron-Removing� wipe or spray to completely prep the surface. It is important to completely strip the paint of any residue AND previously applied waxes and sealants, natural oils and greases. Use a high pH soap that effectively removes oils, greases and fillers. The coating must bond to the paint to be effective! Once the paint is clean, dried and polished we can start applying our coating. Apply to one panel at a time - side to side and then front to back (2' X 2' Sections are recommended for safe and effective removal prior to hardening. Wipe/Buff the applied area 30 seconds or less after application. REMOVE COMPLETELY WITH MICROFIBER TOWELS. This will minimize the risk of hazing and shadowing.